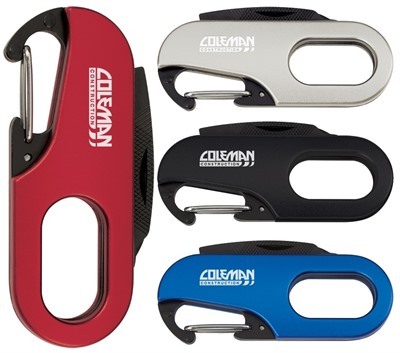 Your Logo does the job on Mini Multitools With Carabiner. Your Logo does the job on Mini Multitools With Carabiner. This handy and compact tool includes a small knife, a flat head screwdriver and a file. It has a carabiner for attaching to a backpack or belt loop. The tool comes in a choice of black, blue, red or silver to best highlight your company name, logo and slogan. Makes a great give-away at team building events.